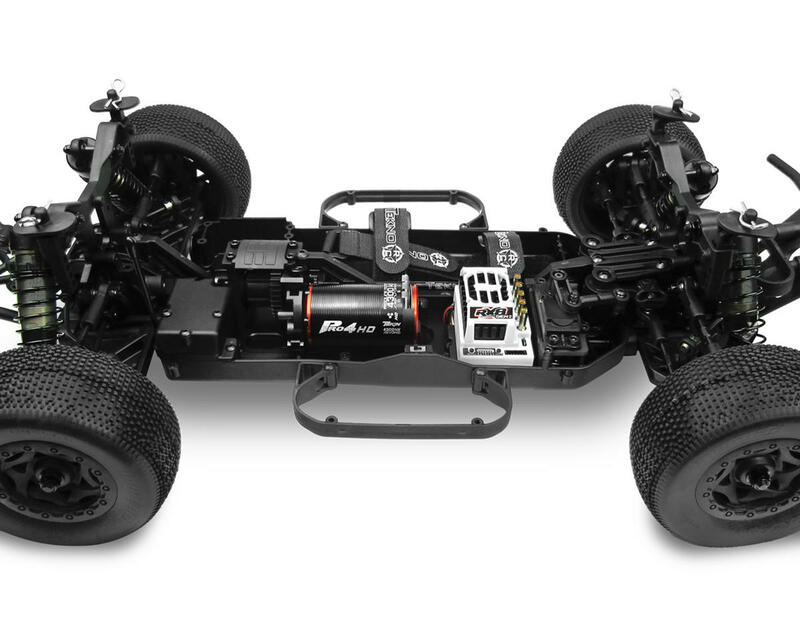 This is the Tekno RC SCT410.3 Competition 1/10 Scale Electric 4WD Short Course Truck Kit. The SCT410.3 is an updated version of the original SCT410 with a slew of updated parts and improvements. 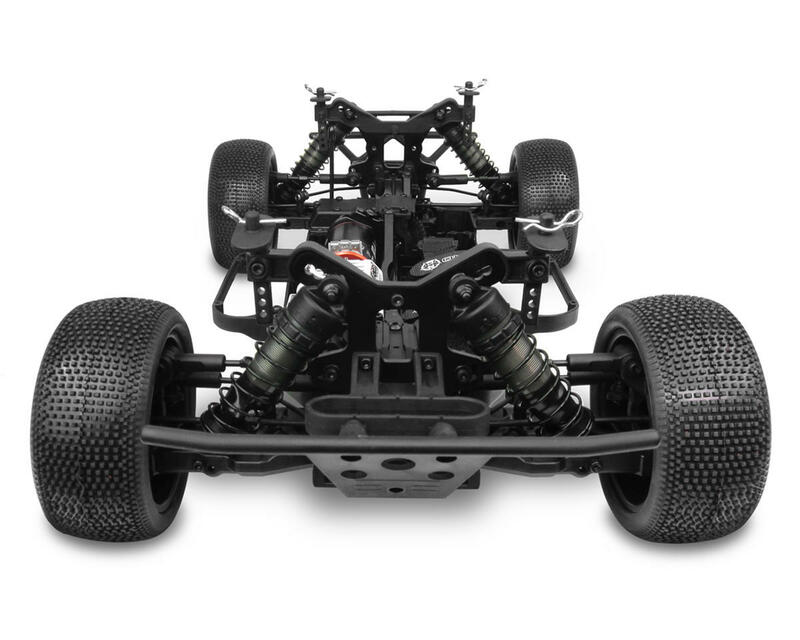 The SCT410.3 leapfrogs over the 4×4 SC competition in terms of performance, durability, and value. 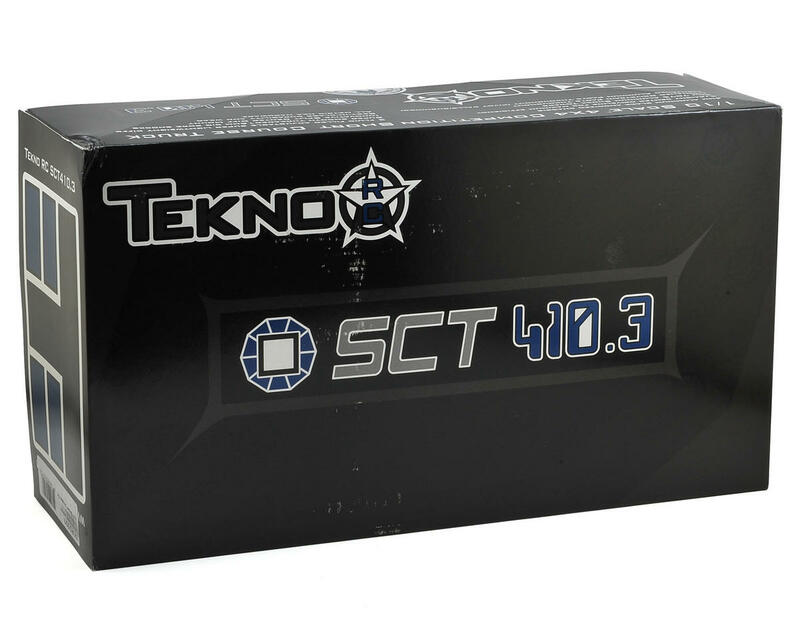 Tekno RC has their customers’ best interests at heart so there is a clear path to simply upgrade your original SCT410 if you already have one. But there’s also nothing like a fresh new kit that goes together like butter! 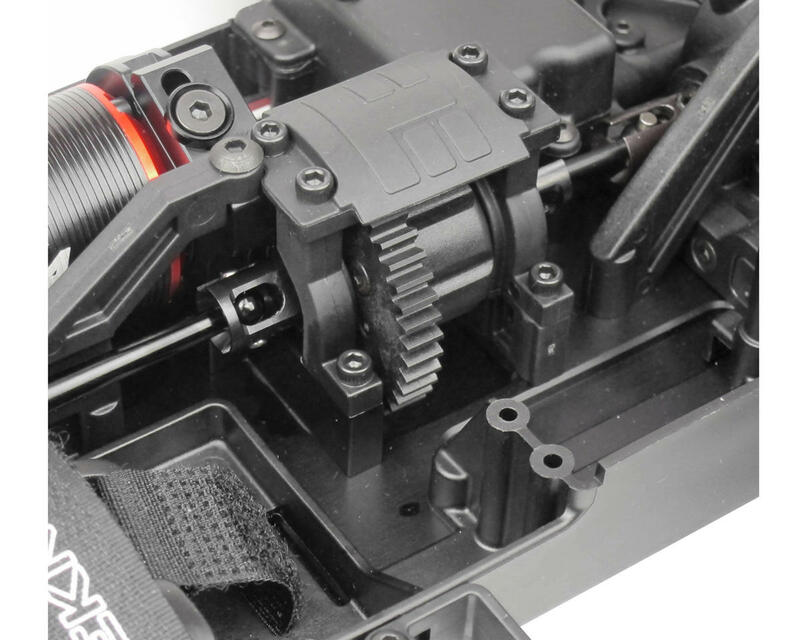 The diffs feature smoother gears and a updated 1-piece composite diff cross pin. The old steel driveshaft has been replaced with a updated tapered aluminum design. All updated front and rear suspension geometry. Updated reduced height front and rear shock towers. Updated V2 hinge pin brace system for incredible adjustability. Updated front arms feature a flat bottom for increased durability and clearance. Updated rear arms feature the flat bottom but are also 4mm longer. Updated rear hubs with reduced offset to match the longer rear arms. Updated longer rear sway bar. Updated clamping spring perches with captured shock boots. Updated droop adjustment screws are now standard. Updated lighter camber link rod ends and turnbuckles. I wrote a review 10 months ago. I am going to write a new review a try to do a better job of what I like and dislike. To better understand the writer, I race 1/10th 2wd & 4wd SCT and 1/8th E-Buggy. I race 2wd spec and mod Team Associated and 4wd SCT Tekno SCT410.3 and the .2 buggy. I have 9 other trucks and buggies to choose from but this is what I have stuck with for now. First, I'm going to start with dislike. 1) The composite cross-pins in each diff. I use aluminum. 2) The stock set-up. I know by now everyone knows the stock set-up is crap. If you are nose diving and you are close to stock, its probably from chassis slapping the rear of the truck. 3) I have very precise scales and the truck is off balance with a Tekin 4300HD motor, RX8 ESC, Protek 150 servo and a Trinity 7150MaH 100C battery. You need approx. 38-45g in front of the servo and 60-70g just in front of the shock tower on the batter side. I like most of everything else on the truck. I would have liked to have seen the aluminum hinge pin holders A,B,C & D along with aluminum diff cross pins but in my opinion, they do not slow the truck down. My shocks are built with 8x1.4 tapered down pistons. I am using 32.5 wt AE oil in the front and 30 wt AE oil rear. I feel the truck has a high roll center and made all of my camber links longer. I only run 2 degrees of anti-squat and it jumps better and obviously handles bumps better. I run full rear toe in and 1.5 degree front toe out. It works for most tracks without changing anything. I am still running 8 x 1.4 pistons but I have increased the oil to 40 AE front, 35AE real and pink springs both front and rear. The previous setup is too soft and allows the truck to transfer weight too quickly. This new setup does not throw the weight to the front coming off power and visa-versa. I truck jumps very flat and the dampening is very good for virtually all indoor tracks at least as a starting point. IMPORTANT: make sure you do not run bump steer with this truck. You can check by holding the truck up in the air with the tires off with the A-arms flat and find something that is parallel to the outside of your wheel mount (Stub Axle). Pull the A-arm to compress the shock and the wheel mount should stay on the same line. If it moves inward, you have positive bump steer and out is negative. You can change it by add/removing washers under the Ackerman or at the steering spindle. Also, It seems to be best not to run more than 2* of anti-squat as the truck wants to nose dive at times. I know its a lot to read but I hope it helps. 28 of 33 customers found this review helpful. 2018 - My son has raced (aka. durability tested) this kit and it's held up well. Definitely need to tighten the 8 cap head screws (4 on each side) in the carrier / spindle regularly (aka. after every race) as they do loosen off as you run. 3 years later, still happy with this kit and we'll continue to run it. 2015 - Excellent kit from Tekno! Parts quality is very good and the build is super smooth with easy to understand instructions. Would be nice to have the option of a higher priced 'team' version of the kit that includes the optional upgrades (i.e. aluminum diff cross pins, aluminum hinge pin braces, etc.) so you wouldn't have to get the parts separately. Overall, excellent! Highly recommend this truck! This was my first Tekno build and I'm very impressed. Quality is amazing, everything fit perfectly without shims and manual is best I've ever seen. On the track, its sick. I used the specs for a indoor clay track listed on website and was almost perfect. Already had a few hard hits and kept going as if I hit a pillow. I'm a long time AE fan but after this Tekno build, I have a feeling I'll be looking at Tekno more. Kit is great. I recommend the alum servo horn, springs and 6 hole pistons. Wear is minimal, performance is fantastic and durability is incredible. Tekno got it right. Exceptional kit. The best SC truck out in my opinion. The added weight is what makes this truck so good. It's a beast, built solid and well engineered. The diff screws everybody talks about being hard to get threaded in... Not an issue at all. They go together very easily with good tools. I don't understand why people can't get them in. Don't use power tools, build the kit by hand. I only have two gripes: #1 The center Diff Mounting brackets being plastic (kinda chinsey feeling). #2 The weird suspension set up that comes box stock with the truck. The spring rates & oil weights are kinda an odd choice (front is real stiff, and the back is very soft). Its a VERY quality kit, very durable, very race oriented, very easy and fun to build. I've built TWO so far, and I give this kit a solid "A". Tekno did a great job! Put a big nasty 550 motor in it! And plan on buying extra Pink & Green shock springs! First Tekno kit. Excellent. Great instructions and a pleasure to build. Have also built Kyosho and Losi kits but this is my favorite so far. Converted this into the DB48. 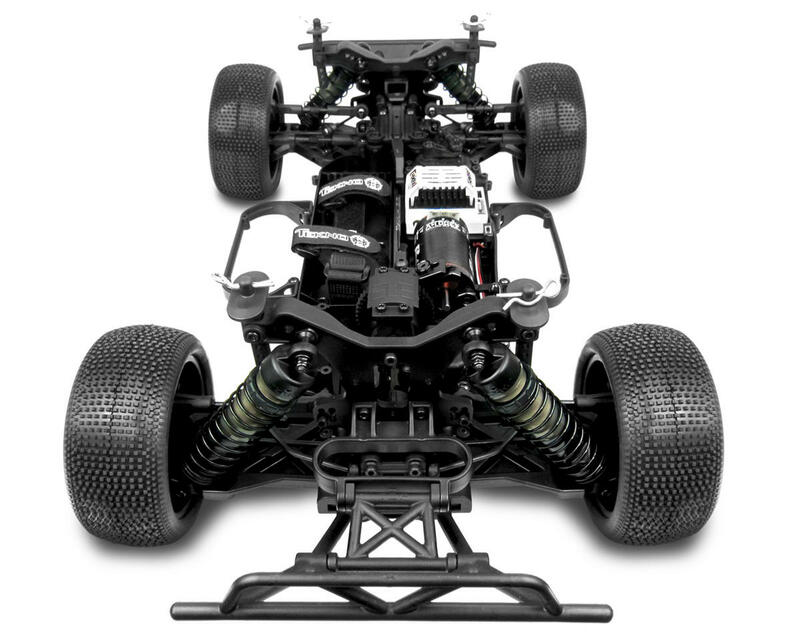 Rock solid and well designed chassis and quality parts. Now I know why everyone raves about Tekno! I've been bashing RCs around for about five or six years now. I've owned a lot of different kinds of RCs and gained a lot knowledge. But even though I took several slashes out to the track over the years, I never took racing seriously. I took a break from the RC world for a while, and wanted to get back into it. I had sold off all of my old RCs and so I bought a Slash 4x4. I bought the center differential. I bought the LCG conversion kit. I tried to tune it. Bought all the spring kits, tried all the online setups, different shock and diff oil weights, different shock builds, nothing I did made it drive the way I wanted it to. So I decided to take the dive and buy my first kit RC. When I opened the box what I saw was daunting. I was relieved to find that the instructions were extremely clear for the most part. My instruction manual had an arrow pointing to the wrong hole for the rear chassis brace (it goes on the opposite side as the others) and one of my bags had two extra very short counter-sink screws that were not accounted for in the instructions. But other than that everything was extremely clear and easy to follow. After I got the roller built I put the RX8 GEN2 from my old Sportwerks Mayhem E-Buggy I converted in it and bought a Tekin Pro 4 4600kv and a Savox SC-1267SG servo to drop in. I upgraded my transmitter/receiver from the Traxxas TQi system to a Futaba 4PL and a Futaba R2104GF receiver. After setting the RX8 GEN2 up for 2s and 7.2v BEC I ran a couple of packs through it. 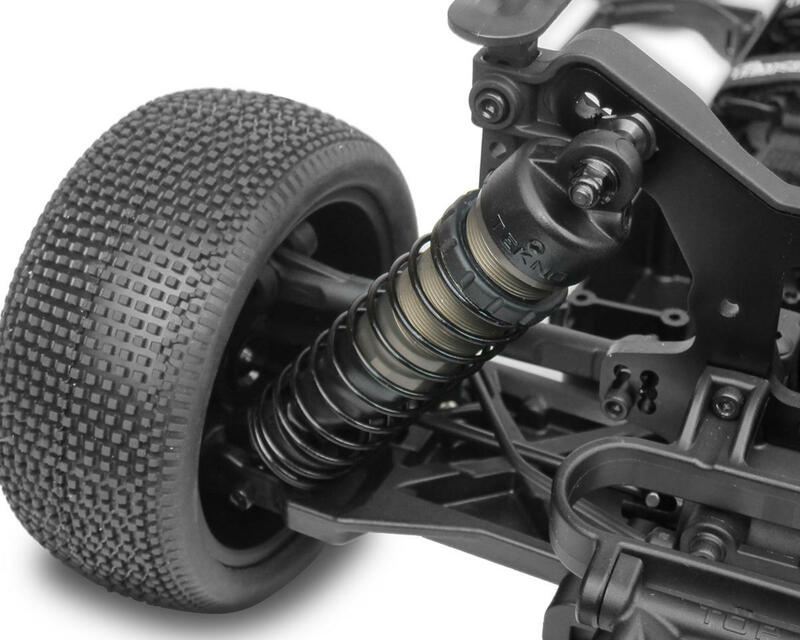 The stock rear springs are extremely soft and required 3/4 preload just to keep the rear end off the ground. My local hobby shop suggested red springs for the rear which let me reduce the rear preload to just 3-4 turns in the rear. I ended up with my ride-height just a bit higher than what the manual states, but the lower control arms in the front and rear are both level with the chassis, which is usually what is recommended. A bit of fiddling with the turnbuckles to get everything aligned, re-dialing in the steering trim, and getting everything driving straight and true was also very helpful. After that I ran about 2-3 packs through it and was amazed at how well it handle. It absorbed the rough stuff easily with still plenty in the suspension to support the truck through the turns without digging in. Throttle response is excellent with little to no loss/lag in the drive train. Motor temps were about 160F and the ESC was around 76F after 10 minute runs on a 16t pinion gear so I swapped in a 15. I had the tuner specialist in the shop dial down the punch on my ESC to help with the rear tires spinning when trying to get on the throttle out of turns and my temps evened out to ~118F on the motor and ~98F on the ESC so I know the system is happy, and the control is still good. Being that I am not a pro, needless to say I have crashed this many, many, many, MANY times. The brand new slash body I put on it (I had it laying around, it's a nearly perfect fit for this kit) is nearly destroyed, while the kit itself remains mostly unharmed. I highly recommend skid plates for practice sessions to help save the chassis if you are an unskilled driver like myself as that seems to be the only part of the truck taking wear at the moment. Even the front bumper is still in immaculate condition considering the pounding I've given it. I did manage to land out of a huge jump directly into a massive nail holding down some of the track pipes during a run. As I limped it to the side of the track with one of the front wheels perpendicular to the car I feared the worst. However all I managed to break was the A-Block, nothing else was bent or broken. The sway bar link had come out of its ball joint, but a new A-Block and 5 minutes wrenching and I was back in action. I splurged and got the aluminum block, but honestly if that's what it takes to break the plastic one it's probably more than fine. With the help of the pros at my local track I've managed to get it dialed in and am now enjoying my wheel time immensely. I can't wait to get good enough to start racing, but I can already keep up or go faster than a lot of people running 1/10th scale. All in all I am extremely happy with this kit, and if I decide to go 1/8th scale buggy I'll be getting the EB48, which is exactly the same as this kit with 1/8th scale buggy trimmings! Bought this truck as my first tekno and i have to say oit of all the kits ive put together this is by far the easiest and most fun except the turnbuckles. I will be buying another tekno soon and cant wait to build another. I upgrades a few odds and ends. Stiffer and longer springs aluminum servo horn 1/8th scale wheel adapters mostly small things running on 3s with a hobbywing pro sct sensored and its screaming fast. Its also super stable and jumps well running stock fluids at the moment except for the grease is a heavy duty blue grease i get from work of much higer quality than normally used in rc and automotive products. If you want a write Short Course Truck to start it off, buy this. Don't waste your money on Traxxas Slash or other Associated SC10 stuff. This is what you want to get. Trust me, Been there done that. This car will handle extremely well stock. Race ready is an understatement. The center differential really helps put the power down evenly so the car would not flip over. The durability is unmatched to any other brands. However, I recommend few upgrades for the future. Got my kit 5/21. Instructions are super easy to follow and the kit overall was very easy to put together. I have not had a chance to race yet but from the looks and feel of the truck it should be very durable. The one recommendation that i have is to try to tap some of the screw holes in the diff cases. I stripped a few screw heads and the hexes become slots. Some of the camber links can be tough to thread. But all the hard work will be worth it when its finished because you will have the most durable, best looking ride at the track. I purchased this kit a couple weeks ago, simply because I had purchased the Tekno ET48.3 a couple weeks prior to that and immediately loved it. The kits are awesome and go together perfectly. I am working out the stock setup issues that most people seem to have, getting the right suspension package for your particular track as mine wasnt handling or jumping at all at first. Changed the pistons, springs and oil and im taking it back to the track tomorrow, but I can already tell it's going to be way better. Before it would just come off every jump straight up or down depending if there was any lip at the top of the jump. Anyway, I haven't even put together 3 good laps on a row yet but this thing still gets 5 stars. UPDATE: Truck performs much better and it's close to being really good on my track. It crashed this thing so many times now off jumps and running 4s is just stupid, but I haven't had one issue with it other than destroying my first body within the first 2 batteries. The better I get it performing the more I like it. If you want a real 4wd short course truck, a kit you build yourself and get to pick what goes on it, this is far and away the best choice. Way more durable than that other one that everybody buys. I've had a couple of them myself and they aren't even in the same neighborhood as far as quality and especially on track performance. Tekno and AMain all the way! so-- I wanted to run this truck for several races before writing anything up. But I'll start from the beginning. I've been running SCT trucks competitively now for about 5 years. Started out with the Traxxas Slash. Broke constantly, and even with tons of upgrades, still broke all the time and could not keep up with competitive racing. Sold the Slash and bought a slightly used Losi. Alot better than the slash, but still broke often. Also, had alot of slop in steering and suspension. Constantly had to buy steering ends and control arms. And even when it was tight, best finish I could get out of it was third after two years of racing. 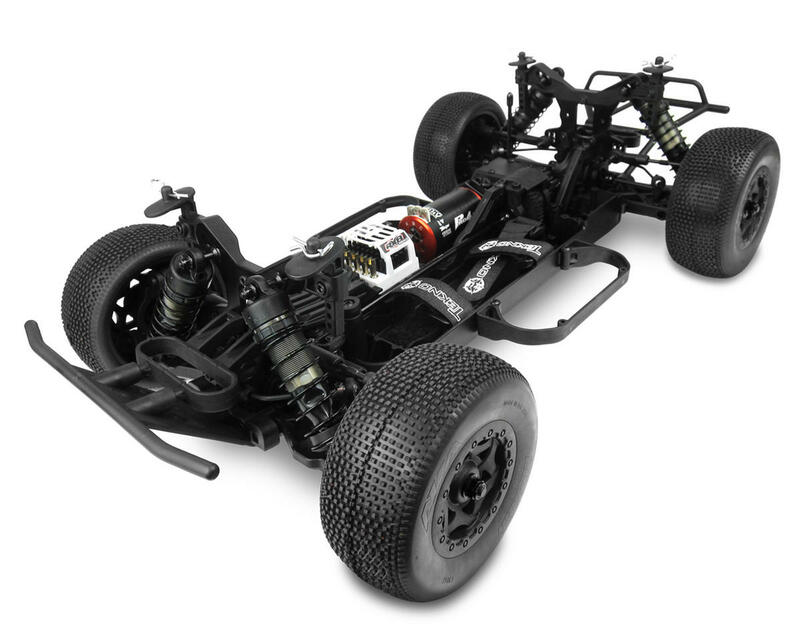 So-- sold the Losi and bought this Tekno. Best decision I could have made. This thing never breaks just for starters. I have been hit multiple times by fellow racers really hard, and this truck just shakes it off. I have now run it in 6 full out races, qualifying, and mains. I have yet to have to replace anything. And with the correct suspension adjustments for your track, it sticks to the track like glue. I run on a outside clay track with large jumps and it sails over them with no issue. Just so you know, I'm running a Tekin ESC and Tekin 4600 motor and this thing just out and out flies. My past two races I took first in both. So to say I'm happy with this truck is an understatement. If you want a strong, dependable race ready SCT, don't waste your time with other trucks. Buy this Tekno, you won't be disappointed. The best SCT I have ever owned. Awesome handling and fun to drive. Amazingly engineered. Build like a tank, very robust. This is my most favorite RC from my collection. My new SCT410.3 came Friday morning and I stayed up all night putting it together. I couldn't wait until morning to give it a try so I went to the park next door at 3:00 in the morning and drove it straight into a tree at full speed in the dark. The truck showed absolutely no damage, but I decided it best to wait until the sun came up to give it a true test-run. The truck really ran well and I was very impressed with the stability around corners at high speed as well as it's ability to accelerate in a straight line in poor traction conditions. I have made a few adjustments to the truck, but most of the time I went back to the stock settings. I did lower the center of gravity a half centimeter or so by adjusting the droop screw and that did seem to make a significant difference in stability. I had no trouble putting it together and the directions were well written and clear. I did not have any problem putting the diffs together as another reviewer had mentioned, but I did crack the first hex I installed as I was tightening the set screw. The hexes do seem rather light weight for a truck like this. I had a replacement in my box so it didn't hold me up at all, but be careful installing these to keep them from cracking. Overall a great truck so far and I can't wait to get some good racing in this summer!